Autism Spectrum Disorder (ASD) is a neurobiological disorder affecting 1 in 150 children. It is often diagnosed by age 3. ASD diagnostic features include marked impairments in social interaction and communication skills as well as restricted behaviors and interests. Our experience has highlighted - as has the research - the tremendous potential of children with autism. With appropriate intervention, it is amazing what can be accomplished. Each child has unique needs and potential. 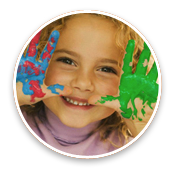 Through collaboration with the family and intensive early treatment, children will achieve wonderful success. In 1943, Leo Kanner differentiated autism from childhood schizophrenia. In the 1970s, Bernard Rimland challenged the idea that autism was psychological, asserting that it was neuro-biological. In 1966, the behavior analysis approach was first used in the treatment of autism by Dr. Ivar Lovaas of UCLA. In 1987, he published a study documenting the success of this treatment, finding that 47 percent (9 out of 19) of the children who received 40 hours of intervention per week were able to enter typical schools and complete first grade successfully. Autism is diagnosed based on behavior theory, which lends itself to a focus in treatment and intervention. Autism is classified as a Pervasive Developmental Disorder in the Diagnostic and Statistical Manual-Fourth Edition (1994). According to the DSM-IV, the diagnostic features include the presence of markedly abnormal or impaired development in social interaction and communication as well as a markedly restricted repertoire of activity and interests. The symptoms of autism are discussed in terms of behavior excess and deficits. Children with autism do not usually display deficits in visual or auditory memory, motor development, or physical appearance. Autism is the most common developmental disorder in the world and is more prevalent than Down's syndrome, cystic fibrosis, and childhood cancer. Autism affects approximately 1 in every 150 children. Autism is 4 times more prevalent in boys than girls and knows no racial, ethnic, or socioeconomic boundaries. Autism usually appears in infants prior to 30 months. Some prevalent characteristics include a lack of eye contact, intolerance to physical touch, a lack of appropriate play, inattention to other children, seemingly deaf, severe language and socialization impairments, resistant to change in the environment, and minimal attention span. Autism is a spectrum disorder that can occur in many combinations, ranging from mild to severe. Approximately 70 percent of all children with autism have intellectual disabilities and exhibit challenging behaviors such as aggressions and self-injury. They may also be susceptible to comorbid mental health conditions such as anxiety, depression, and seizure disorder. Children with autism may test within the range of mental retardation on a standard IQ test before receiving treatment because they are considered “untestable”; these scores may not be a true reflection of their intelligence. About 10 percent of individuals with autism are savants - a non-medical term that describes a rare condition in which individuals with developmentally disabilities have an expertise and splinter skills in one or more areas. Savants have exceptionalities in one or more of the following areas: mathematical calculations, memory feats, artistic abilities, and musical abilities. See below: Savants and Autism. About one third of all children with autism develop seizures in adolescence. Research has not found any single cause for autism; it usually stems from multiple etiologies. Current research is focusing on genetic, biological, and environmental components contributing to the cause of autism. The only scientifically valid treatment for autism thus far is behavior modification therapy. (read more) There is no known cure for this lifelong disorder. However, some individuals show significant progress with treatment. Progress varies greatly among individuals - some may even become indistinguishable from typically developing peers. Treatment should begin at an early age as the plasticity of the young brain allows for greater progress. Individuals with autism live a normal lifespan. Celebrating the success of individuals with autism and pervasive developmental disabilities. Whether it's a small measure on a graph, goals that have been reached, or great personal achievements, the hard work of individuals with autism is an inspiration to their peers, educators, and the community at large. Savantism is a non-medical term that describes a rare condition in which individuals with developmentally disabilities have an expertise and splinter skills in one or more areas. A characteristic common to savantism is a remarkable, yet narrow, memory. Savants also have exceptionalities in one or more of the following areas: mathematical calculations, memory feats, artistic abilities, and musical abilities. Approximately 10 percent of individuals with autism are savants. In the non-autistic population, this proportion is estimated to be only 1 percent. However, these numbers, although commonly cited, remain inconclusive. Some savants have neurobiological exceptions, especially in the left hemisphere of the brain. Approximately 100 individuals alive in the world today are believed to be a prodigious savant, which is someone whose skill level would qualify him or her as a “prodigy”—even in the absence of a cognitive disability. About half of all savants are believed to be prodigious musical savants. Historically, the term used to describe such individuals was “idiot savants,” a French term meaning unlearned (idiot) skill (savant). In 1978, Dr. Bernard Rimland introduced the more appropriate term “autistic savant” in an article in Psychology Today. He believes the savant has an incredible ability to concentrate and focus on a specific area of interest. Some researchers believe understanding savantism will help us learn more about how our memory and cognition works. Musical savant pianist who has mastered over 10,000 pieces (including hundreds of original compositions). She is blind and has autism. One of the best savant jazz musicians in the United States, he plays 18 to 20 instruments. He was born blind and with autism. This extraordinary blind British musician plays by ear and has memorized thousands of pieces. He discovered his gift at age 4, when he pushed a girl off the piano and began playing in her place. He is officially considered a true autistic savant—one of only 100 in the world today. He requires assistance in all daily skills. This blind American musician played piano and gave many concerts. He was featured on many TV shows due to his gift for music. He was adopted by a nurse named May Lemke. Born prematurely, Leslie could not swallow his food without assistance until he was 1 year old. By age 7, he started to show progress. He first stood at age 12 and walked at age 15. He began playing the piano at age 14 after hearing Tchaikovsky's Piano Concerto no.1. Leslie toured the United States, Scandinavia, and Japan. This American autistic jazz prodigy learned to read by age 18 months. He was diagnosed with PDD at age 3. By age 6, he had taught himself to read music and play the piano. He has perfect pitch and has released several jazz albums. He has received many awards and been featured on many shows. This artist from Seattle, Washington, speaks several languages and can play just about every instrument he picks up. He is best known for his visual lists, which consist of everything from bugs to Italian roosters, buildings, emergencies, and flags. His work has been published in Princeton Architectural Press’s Blackstock's Collections: Drawings of an Autistic Savant. Susan began drawing at the age of 5. She paints eclectic portraits and landscapes from memory. She has attended the Pure Vision Arts studio in New York City. She currently lives in New York with her mother. This Scottish painter drew with a unique medium of wax oil and crayons. He was born with autism and was legally blind. He didn’t functionally communicate until he was 11. His work is beautiful and unique—even the Pope owns one of his paintings. This American sculptor and autistic savant creates highly detailed, very precise, and spirited sculptures of animals. He makes these amazing sculptures at very fast rates. He has had many gallery showings. Seth paints to describe his world of color and fantasy. He lives in Ohio with his mother. Jonathan began painting at age 10. His charcoal drawings capture pure expression in the images of faces. He was diagnosed at the age of 2 and lives with his mother in New York. His artwork is his livelihood. This artist from Massachusetts has become nationally recognized for her magnificent pop-art architectural paintings. This Iranian artist lives in France. He is unable to speak, walk, or feed himself, yet he captures amazing silhouettes and images in his oil paintings. His teachers and mother have encouraged him to develop his gift. Stephen is a spectacular artist who, from memory, can draw with incredible details in his panoramic city views. His work has received international appreciation. In January 2006 Stephen was named by Queen Elizabeth II as a Member of the Order of the British Empire in recognition of his services to the art world; no specific mention of his disability was made in the citation. He has a permanent gallery at the Royal Opera Arcade, London. He did not speak until the age of 9. This artist from Malaysia paints with various media and has unique style that has received international recognition. He had difficulty with fine motor skills and was home schooled. His skills were developed as his gifts for art were fostered. He currently lives in Australia. This British savant is gifted in mathematics and natural language learning. He can perform complex mathematical calculations at incredible speeds. He also speaks seven langauges. This American professor at Colorado State University is a professional designer of humane slaughterhouses. She was diagnosed with brain damage at age 2 and began talking at age 4. She was re-diagnosed with Asperger syndrome several years later. She invented the “Squeeze Machine,” which delivers a controlled amount of deep pressure to her body as a form of therapy. She has given many talks on living with autism and sensory integration disorders. This Hungarian autistic savant is a highly accomplished poet and writer. She is also an artist. She has written several books about living with autism. She had high levels of echolalia at 9 months (non-communicative repetitive speech). She struggled in school, but discovered her potential in music and art classes. An Australian-born artist, poet, singer-songwriter, screenwriter, and sculpture, Donna has written several books, including her autobiography Nobody No Where: The Extraordinary Autobiography of an Autistic Girl. It became an international bestseller and spent 15 weeks on the New York Times Bestseller List. It was shortlisted for the NSW Premier's Prize for Literacy in 1992. She was diagnosed as psychotic as an infant and finally with autism at the age of 2. Her functional speech developed at age 9.